BREVENA hit the big apple running! Our Brand Ambassador Shawn Diddy was armed with a smile and her favorite skincare, BREVENA, demonstrating the benefits and results of Macro B Complex, BREVENA’s exclusive ingredient. The opportunity to present to beauty industry experts allowed us to stand out from the pack with our unique formula and medical history. After long flights there and back, nothing was better for replenishing our jet-lagged skin than our Restore & Hydrate Overnight Cream. Nothing makes me happier than a little sunshine. With the snowy weather we have had the last couple weeks in Minnesota, I am elated to hop aboard a plane in a few short days and represent BREVENA at the Pre-Oscars Gifting Suite in sunny Beverly Hills. Toting our lightweight Daily Hydration Moisturizer as the perfect base for makeup, as well as keeping your skin in tip top shape for those no makeup days, we can’t wait to get BREVENA in the hands of Hollywood’s elite. Not only is keeping your body in shape important, so is keeping your SKIN in shape. BREVENA hit the ground running at MSP Magazine’s Fit Fest in Minneapolis. This event featured fitness classes, as well as seminars on nutrition and vendors offering everything from fitness attire to snacks and everyone’s favorite MN Made Skincare, BREVENA. We had the opportunity to allow attendees to try the Intensive Foot & Heel Repair (everyone can benefit from softer feet, especially fitness fanatics!) and even gave away a skincare set to a lucky winner! BREVENA had a fantastic time participating in the Minneapolis Holiday Boutique at US Bank Stadium! We were able to connect with existing customers and some who have been interested but wanted to try the product in person. We had a Christmas tree filled with prizes, ready to gift items, and even Elizabeth from Twin Cities Live stopped by for a meet and greet. May your skin be merry and bright this holiday season with a little help from BREVENA! 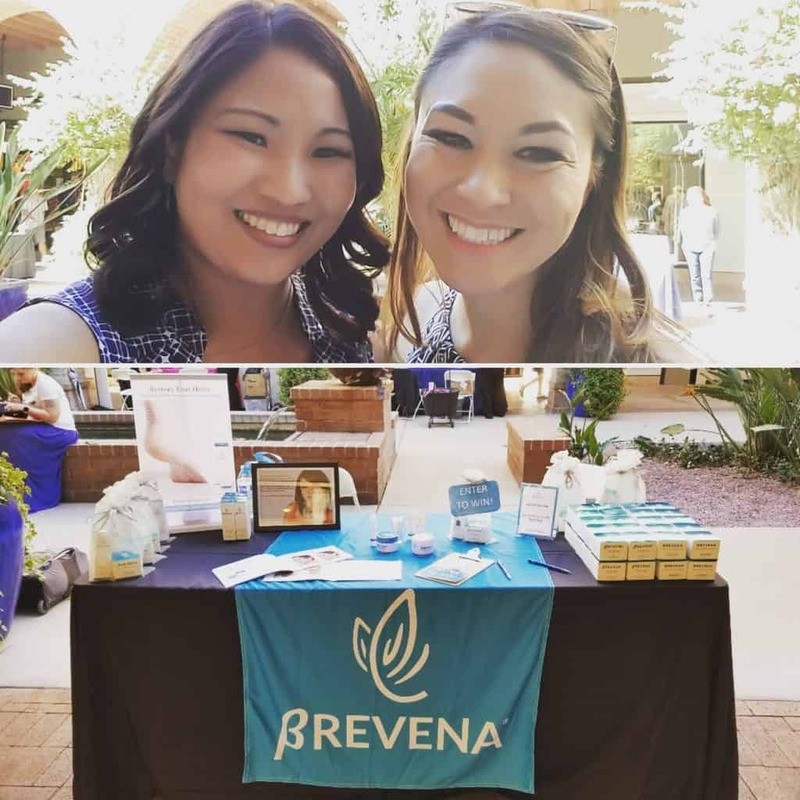 Holly Schnetzler with BREVENA spent Saturday, Oct 7, 2017 in Tucson, AZ at the Women’s Spa & Wellness Showcase! Tina Jennings from Morning Blend Tucson was at our table sharing her favorite BREVENA products with everyone. Tina is obsessed with the Intensive Foot & Heel Repair, keeping her feet soft and smooth! As an added bonus, it extends the life of her pedicures! A MUST HAVE for every household, BREVENA is making waves down in Tucson! BREVENA made an appearance at the Mpls/St. Paul Magazine premiere fall fashion event, Fashionopolis at Aria in Downtown Minneapolis on September 14! We were thrilled to be featured in the exclusive VIP gift bags giving fashionistas a chance to try our lightweight Daily Hydration Moisturizer and Restorative Skin Balm. It was exciting to see new styles and trends from local boutiques and designers march down the runway. Our Marketing and Design Specialist, Brittany Hughes was even able to connect with her friend Ladonna Craelius who modeled in the show. It was an honor to be part of this chic event. The worldwide beauty industry comes together for Cosmoprof located in bustling Las Vegas. It is the largest business-to-business beauty event in North America. Keeping our finger on the pulse of the beauty industry, our days are packed full of meetings, learning and networking events. BREVENA had the opportunity to connect with over 1,000 exhibitors and share our revolutionary Macro B Complex with national and worldwide skin care experts! This was a wonderful opportunity for us to showcase BREVENA and learn alongside experts from around the world. Minnesotans are crazy for local brands. With this knowledge and our desire to scope out the new US Bank Stadium, how could we resist participating in the Minneapolis Holiday Boutique? The response was amazing. So many who attended sought us out and eagerly tested our products. They also took advantage of purchasing them on the spot to receive a special event only holiday gift. This is an event we won’t want to miss and will continue to attend! Happy shopping from BREVENA! 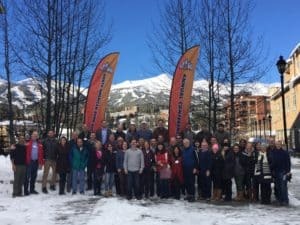 Every winter BREVENA gets back to our medical roots as we connect with doctors and other key medical professionals in the burn industry during National American Burn Society (NABS) Conference. This event is held annually and combines education and awareness of the latest burn technology, as well as deepening relationships within the burn community. Skiing, mini sessions and networking within this close knit community is something we look forward to every year. BREVENA’s technology started in the burn arena and continues to make a difference every day!